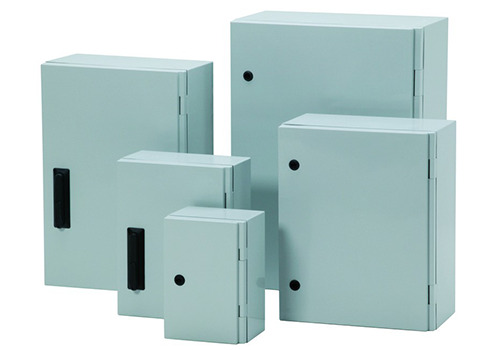 An electrical enclosure is a cabinet for electrical or electronic equipment to mount switches , knobs and displays and to prevent electrical shock to equipment users and protect the contents from the environment. The enclosure is the only part of the equipment which is seen by users; in many cases it is designed not only for its utilitarian requirements, but also to be pleasing to the eye. Regulations may dictate the features and performance of enclosures for electrical equipment in hazardous areas, such as petrochemical plants or coal mines. Electronic packaging may place many demands on an enclosure for heat dissipation, radio frequency interference and electrostatic discharge protection, as well as functional, esthetic and commercial constraints. Telcordia Technologies has proposed generic requirements for telecommunication equipment cabinets. These requirements were developed with the input of United States service providers The proposed standard includes functional design criteria, generic mechanical and environmental requirements, desired features, and performance tests. Telecommunications huts are fully assembled or modular field-assembled transportable structures capable of housing an electronic communications system. These huts provide a controlled internal environment for the communications equipment and occasional crafts persons. The huts are designed with locks, security, and alarms to discourage access by unauthorized persons. Huts can be provided with a decorative facade to comply with local building requirements. Telecommunications huts are designed to withstand climate conditions existing throughout the USA including rain, snow, sleet, high winds, ice, sand storms, earthquakes and lightning.